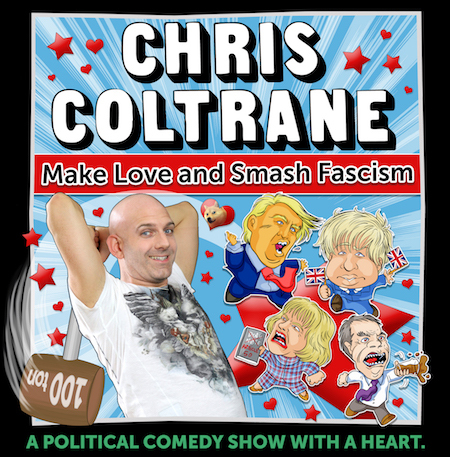 My new stand-up show for 2017 is called Make Love and Smash Fascism. It’s a show about finally feeling hope after so many years of despair. This year I’ve sorted you out with 60 minutes of feel-good punchlines to help you keep on fighting to make the world nice again. Along the way I talk about mediocre pundits, neoliberalism, our discourse, and how to keep on feeling happy in a world that feels so very broken. If you’re feeling sad about the state of modern politics, come along. I’ll help fix your spirit. If you’re coming up to the Edinburgh Fringe, I’d love you to come and see me. I am, as always, doing my show as part of PBH’s Free Fringe – no tickets in advance, just come for free, and pay what you like on the way out. And if you’re not going to the Edinburgh Fringe, take a look at my gigs list – there’s a chance I’ll be bringing it to town near you.